Palomino, formerly known as the Pony bar, is tucked away at the top of Bath street and recently had to change their name due to a dispute with another bar in the country. Sound familiar? That’s because Distill, which we reviewed last week, had to take similar action for the same reasons. As a result, the Pony is now Palomino and they’ve come back not only with a new name, but a redesigned menu and a new look. Inside, the atmosphere is fairly laid back. Soft spotlights shine down on each table and if you’d rather hide away, the tables at the back of the bar are tucked away in the shadows. 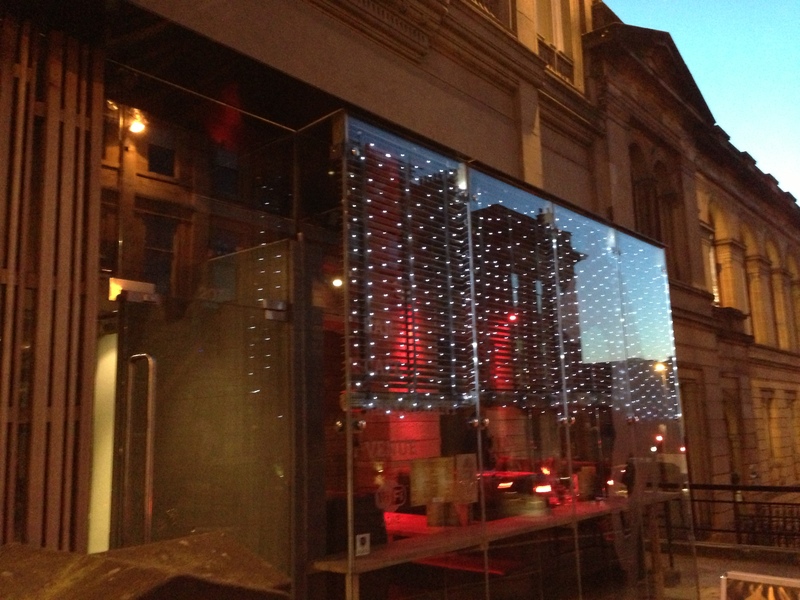 There’s a wide variety of music played in the bar too, ranging from old school rock to jazz. The menu consists of burgers, pizzas and pasta dishes and you’d be forgiven for thinking that it was no different than any other 2-4-1, after work food and drink bar in that area. 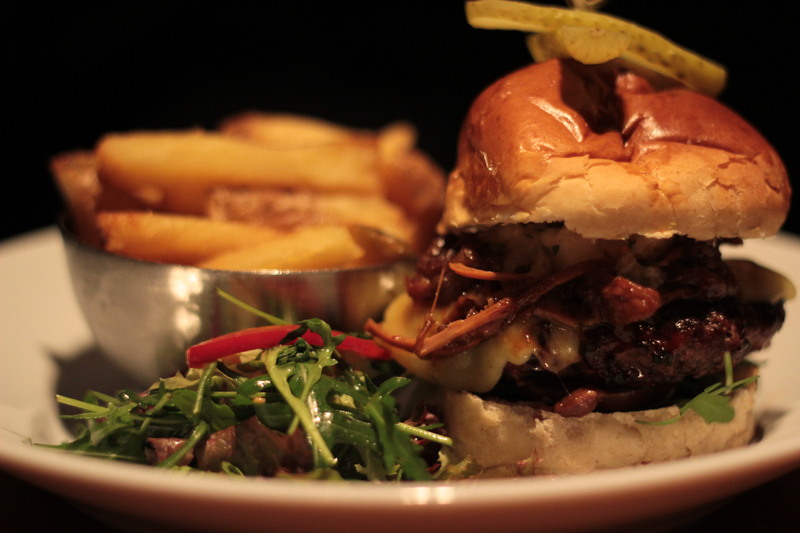 Closer inspection reveals little touches such as patties handmade from a blend of three different cuts of meat, chilli & Parmesan fries and pulled pork that help give the menu it’s own identity. We went for the fat pig burger, which jumped out at us immediately. It consists of a large beef patty topped with pulled pork, gruyere cheese, chargrilled pineapple salsa, BBQ sauce and lettuce on a toasted brioche. You also have the option of skinny fries or triple cooked chips. We also ordered the sliders, so we went with skinny fries with the sliders and triple cooked fries with the fat pig. The skinny fries weren’t much to write home about and were pretty much the same as the ones you’d find anywhere in Glasgow; however, the triple cooked fries were excellent and perfectly cooked. Presentation-wise, this burger was seriously impressive. The patty was big and looked juicy and the pulled pork and BBQ sauce oozed from the sides. The brioche was nicely glazed and well toasted which gave the presentation a nice finish. 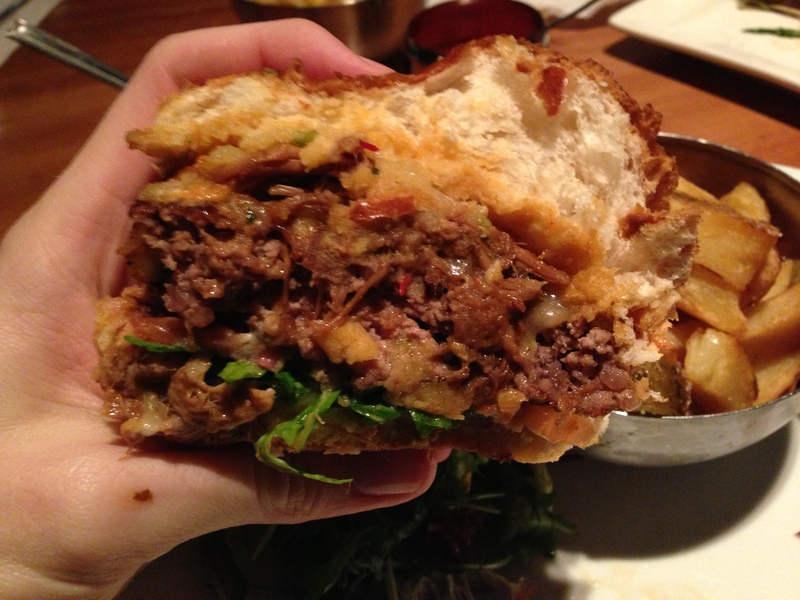 Fortunately, this burger was as good as it looked. The patty was juicy and well cooked, although not quite as pink in the middle as the menu would have you expect. The menu states that all burgers are served medium-pink as standard and while the patty was nicely cooked with hints of pink, I wouldn’t say it was ‘medium-pink’. The patty was well seasoned and moist and had a nice rich flavour, which was highlighted further by the addition of the pulled pork which was smoked and slightly spicy. The kick from the pork was mellowed by the pineapple relish, which added a welcome sweet hint to the burger and also melded well with the rich BBQ sauce. Despite being a frosty February afternoon in Glasgow, there was something very Caribbean about this burger. Even though it was quite heavy, I’d welcome something like this on a hot Summer day with a few cocktails to wash it down with. The brioche was excellent too and despite being heavy on toppings, surprisingly this one didn’t create too much mess and held everything well. 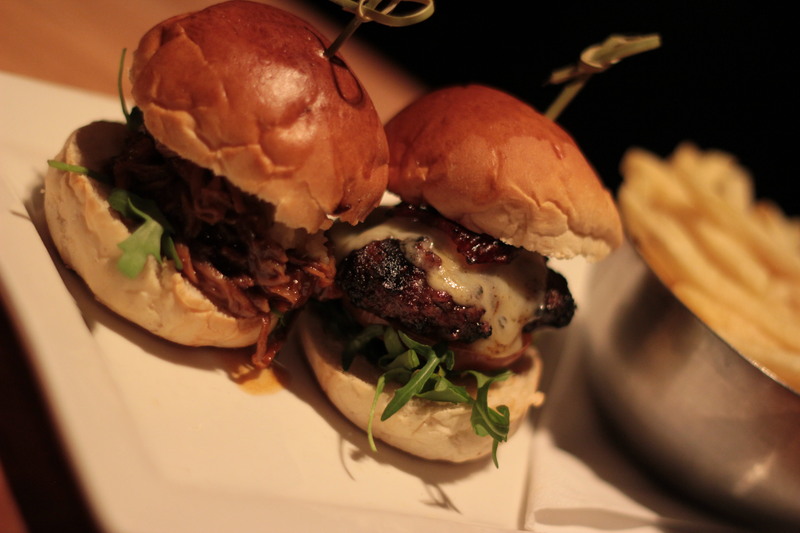 The sliders consisted of two mini burgers with fries for £7. We went for a mini pulled pork and a cheeseburger. Again, they were juicy, seasoned well and very tasty; however, we felt that £7 was a bit much for two sliders, especially when you consider what you can get nearby for the same price. This brings us to our only real criticism of the food at Palomino, which was the price. 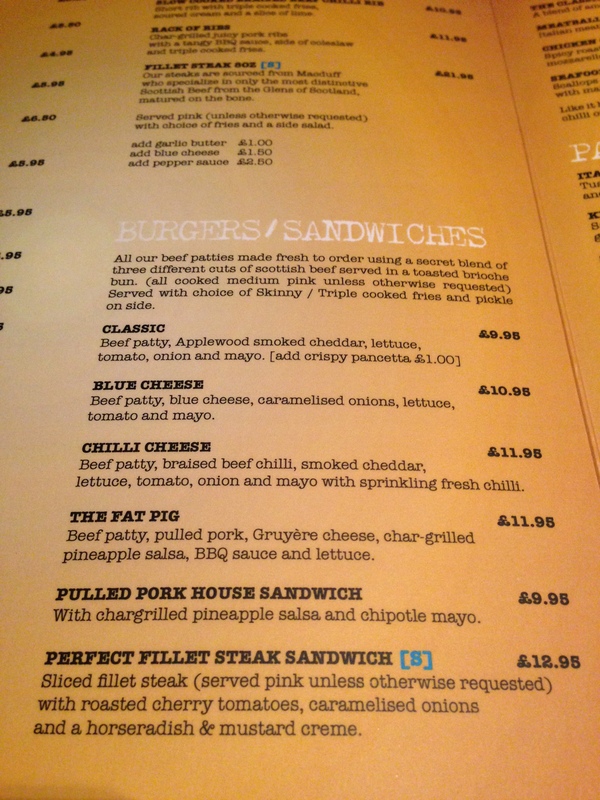 The fat pig burger was delicious, but came in at £11.95. You could walk just a few short minutes to Sauchiehall street and get a very similar burger from Nice N Sleazy for around £7 or two burgers for the same amount of money from Cocktail & Burger. We were very impressed with the burger and will definitely have it again, but the price may put some off considering the competition nearby. 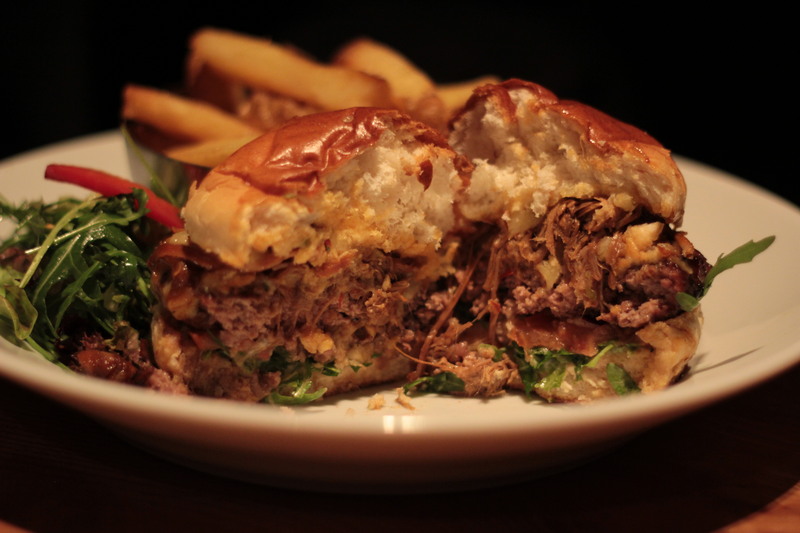 We were pleasantly surprised by the fat pig burger at Palomino. The bar has completely flown under our radar until now. It may be a little pricey, especially when compared to nearby competition, but you should go out of your way to give it a try. 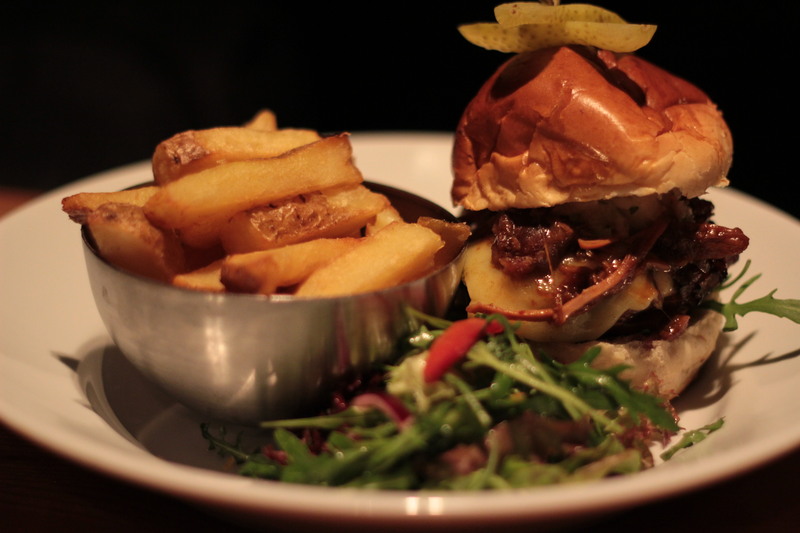 With a burger this tasty and a solid food menu, Palomino one of Bath street’s heavyweight contenders. + Wide range of flavours. – Skinny fries were poor. – Slightly overpriced when compared to nearby burgers.